A website is a destination. Like a store that you have to get into your car and drive to, you have to entice people to come to the site. This next series, Eight Ways to Drive Traffic to Your Website, is designed to help you come up with ideas and strategies to get more traffic to your site. The first tip in the series, Give Something Away for Free, can be a great way to grab people’s attention and introduce your organization to a potential customer. 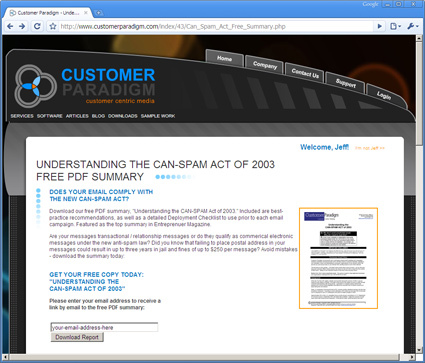 Example #1: Free Topical Whitepaper: One example of giving away something valuable for free occurred after the Can-Spam Act of 2003 was published. For anyone wishing to avoid a criminal offense if they messed up an email campaign, they either needed to read the entire 20-page, dense Federal Law, or they could search for a summary to tell them the bullet points in language they could understand. So we took the contents of the act, and summarized it in a six page document that was designed to be easily read by someone in the email marketing field. We posted it to our site, and we’ve had well over twenty thousand people download the summary. Entrepreneur Magazine featured in their magazine and on their website as an easy-to-read summary. As a result, we’ve had thousands of additional visitors to the site since 2003 that we wouldn’t have had otherwise. Plus, we were able to collect their email address so that we could follow up with them in the future about products and services related to email marketing. We lost about 40% of the people who came to the site because we asked them to enter in an email address. Example #2: Free Chapter of a Book: If you’re like me, you like to flip through the pages of a book before you purchase it. At a bookstore it’s pretty easy. For many books on Amazon, there’s a way to preview a few pages at a time. However, the publisher of my wife’s book (Random House) doesn’t give the electronic copy to Amazon, due to copyright enforcement issues. So for her book, we gave away a free sample chapter (Chapter 1), that allows people to visit the site, enter in their email address, and then receive the sample chapter in their email inbox. The signup page assures people that their email address will be safe, and that it won’t be used for evil purposes. 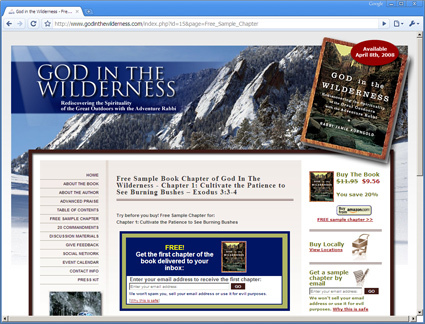 The site uses a little bit of humor as well, saying, “If you can’t trust a rabbi with your email address, who can you trust these days?” At the top and bottom of the free sample chapter is a link to purchase the book. Giving away a free chapter didn’t hurt book sales… in fact it helped increase them (the book is now in it’s second printing). Example #3: Free eBook: If you’ve ever tried to get a book published, it’s not an easy process. Publishers look for very specific things in a book proposal, and if you don’t nail it, they’ll likely move on to one that does. One of our clients, Carol Susan Roth, is a literary agent, and receives dozens of book proposals each week. Tired of getting a lot of proposals that would require a lot of work, she put together a free eBook, 50 Tips for Writing Your Best Selling Book Proposal, and offered it for free on her website, AuthorsBest.com. Because she put this up on the site, she’s been able to position herself as an expert, and increase the quality of proposals that come in to her. Example #4: Sample Product: About five years ago, we helped OxiClean set up a system that would allow people to come to the OxiClean.com website and get a free sample product via mail. It helped the makers of OxiClean (ownership has since changed hands) satisfy four marketing needs: It got a sample product into people’s hands. It helped them increase their direct marketing database (by about 150,000 people). They were able to find out if the recipients had kids and pets (very important if you’re in the cleaning business). We included a viral component, which gave people an incentive to forward it to their friends (and 52% of the audience did).